It would be tempting to call the eight hours of testimony over a proposed moratorium on housing construction in San Francisco’s Mission neighborhood, and the SF Board of Supervisor’s subsequent failure to approve that moratorium earlier this month, a climactic moment in the battle of two very different perspectives about affordable housing. Tempting, but almost certainly wrong, since the vote was hardly the end of the housing crisis in San Francisco or elsewhere. More and even bigger battles probably await. In the interim, two West Coast writers have taken another shot at convincing a sometimes skeptical audience that blocking new development is not the path to affordability. At Portland’s Willamette Week, Aaron Mesh takes on what he calls “five myths about Portland apartments.” (City Observatory’s own Joe Cortright makes an appearance, too.) Most importantly, he points out that new apartment buildings are a symptom, rather than a cause, of higher rents. Ultimately, both are a result of the fact that many more people – and more people with more disposable income – want to live in central Portland than did ten or twenty years ago. Over at Planetizen, Reuben Duarte goes into much more detail about the relationship between new apartments and rising rents, both in theory and in reality. Because rents will grow as long as there are people who are willing and able to pay more, simply preventing new construction can’t bring down prices. In fact, as the number of people who want to live in places like the Mission grows, a smaller and smaller percentage of those people will actually be lucky enough to snag an apartment. And how will the lucky ones manage it? By offering to pay more, of course. Duarte’s own, more nuanced explanation of this dynamic – using the metaphor of baseball tickets – is very much worth a read. He also points out that this all isn’t just economic theory; it’s also reflected in what’s actually happening. 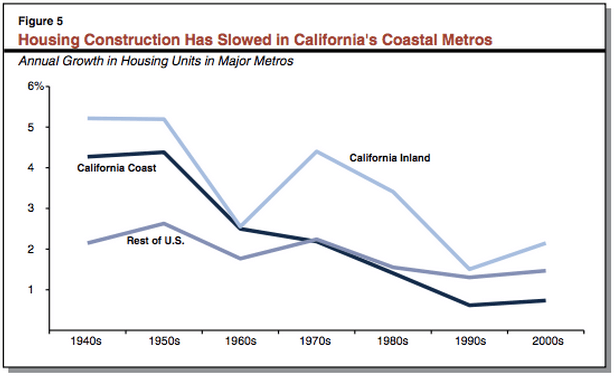 Since the 1970s, coastal California, from the Bay Area to Los Angeles, has seen dramatically slower housing growth than the United States as a whole – even as the region’s population has boomed. This tracks with the Mission’s experience in particular, which saw fewer than 100 new apartments built in the year prior to the proposed moratorium. If low levels of construction were associated with affordability, you’d expect the California coast, and the Mission, to be models of low-cost housing. Instead, of course, it’s entirely the reverse. The problem, of course, is that it’s not at all clear what those immediate anti-displacement policies should be. A moratorium won’t work; neither will supply. Inclusionary zoning won’t produce nearly enough units. Unfortunately, the case that affordable housing in San Francisco, and much of the rest of the Bay Area, is doomed under any realistic policy regime is pretty strong. In part, this ought to serve as a cautionary tale for cities that fail to respond quickly to shifts in housing demand, neither allowing housing growth to match nor devising any other durable protections for residents. The intense movement of concentrated wealth and demand for housing in places like the Mission, though, also suggests that we need to think about housing prices not just at a regional level, but in particular local communities. In places where demand simply overwhelms supply, we need other strategies. If we really want our cities to be integrated, diverse places in the long run, we need to be prepared to offer low-income people off-market housing units and vouchers – not in the almost token-sized quantities of most inclusionary zoning programs, but at a scale that actually preserves housing choice for more than a lucky few.